Familiarize yourself with DataCamp terminology. It's not too bad, we promise! Courses: Exercise-based desktop course for learning new concepts. DataCamp's core product. Practice: Short-series of coding questions/challenges to help reinforce techniques taught in courses. Projects: A Jupyter Notebook-based project where students can apply their skills to real-world problems. Mobile: Our mobile application, which hosts both mobile courses and Daily Practice. Community: Home to DataCamp's free products including tutorials, cheat sheets, and open courses. DataFramed: Our podcast, presented by Hugo Bowne-Anderson. DataCamp for Business: Our business product to help employers/employees level up their data science skills. DataCamp for the Classroom: Free access to all DataCamp content for academic groups. Campus: Our learning interface for desktop products. Teach: Our content authoring application. CL: Curriculum Lead. A member of the Content team responsible for curriculum planning and supporting instructors throughout course design. CD: Content Developer. A member of the Content team responsible for supporting instructors throughout course implementation. CQA: Content Quality Analyst. A member of the Content team that supports instructors with course maintenance. CE: Content Engineer. A member of the Content team responsible for developing the SCT packages that provide students with tailored feedback. Registered student: Someone who has registered on DataCamp, but is not a paying subscriber. Subscriber: A DataCamp student with a paid subscription. SCT: Submission Correctness Test. A test inside an exercise to check that the student got the correct answer. PEC: Pre-exercise code. Code that runs at the beginning of a DataCamp session, which supports the exercise code. Rev-share: Royalties for instructors, paid when students complete their course or project. Course badge: A graphic we create specifically for your course. 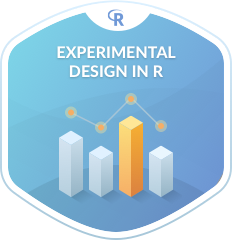 The course badge for Experimental Design in R.